Aneska is here! And with her, a bunch of improvements and adjustments. Reborn from her ashes, the Scourge of Phobos joins the Raiders! - Aneska can now be recruited by players with 61+ level. We've identified a long-standing bug that caused some entities to bypass some game-mode damage multipliers. Those entities were dealing less damage than expected in training mode and when playing as a Raider against an Antagonist as well. - And with this new patch, also Aneska's Mech. Note that this hasn't been affecting game balance. The game has always been balanced around that bug, however, we had less control over damage input and output than we thought. When this bug is fixed, all numbers will be adjusted accordingly and we'll be able to more correctly adjust these abilities' power levels. This is fixed in our internal version but is not published along with this patch yet. A patch will follow soon featuring these adjustments. In Spacdelords, we've structured player advancement in terms of levels. Players gain levels fairly quickly, specially at the beginning, gaining close to one level per match for the first 10-15 levels. Most of those level-ups, however, don't provide much direct player power. 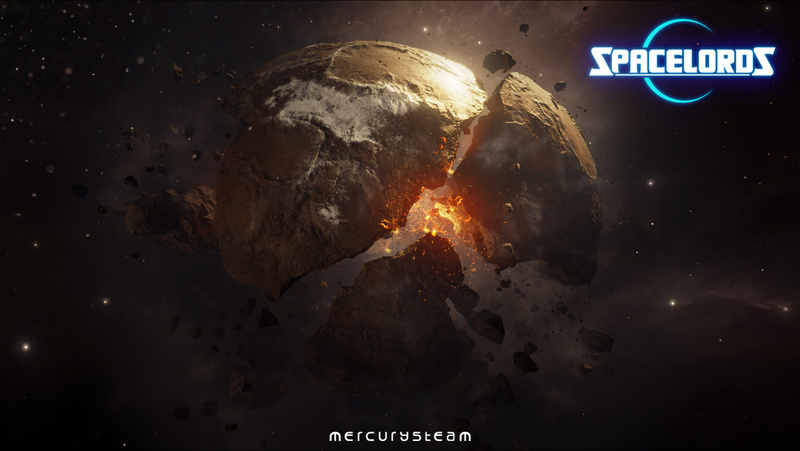 Spacelords is a shooter and ultimately, a game of skill. Power imbalance is only actually meaningful at around 20-30 level differences. This contrasts heavily with how level differences convey power in most other videogames. A PVP battle with a 20 level difference on most MMO or ARPG games is not a fair contest at all. Veteran players know Spacelords well and adjust their expectations accordingly. New players, however, have previous knowledge from other games and have negative reactions when they see these differences. Spacelords also structures players into Tiers. Tiers are a much better indicator of power difference. If a Tier 6 is playing against a Tier 5, it looks like there's some power difference. When a Tier 6 faces a Tier 4, the power difference is clearly bigger. Clearly put, tiers better represent power differences between players than levels do. - Players now show their Tier Rank in matches instead of their level. Some players have achieved levels far beyond the level 100 required for Tier 1. This is a great accomplishment and we want to properly reward that in terms of prestige towards other players. We are very concerned that with this change we're removing the only feature that shows everyone how hard those players have worked. Our next update will feature a new system that will properly reward these players with much more that just a level show-off, however, in the meantime, we appreciate your patience and understanding. There are many aspects to match difficulty, enemy health, damage, AI behavior and sheer amount of on-screen enemies. We've tuned how we apply difficulty increases to make sure that difficulty is felt as an interesting, challenging change (more enemies, more intelligent) rather than straight power upgrades (damage and resistance upgrades, commonly known as bullet-sponge enemies). - All game difficulties has been adjusted. Simply put, this should feel like more but less powerful enemies. Playing as a Raider or as the Antagonist should be a matter of personal preference. Playing as a Raider is a cooperative, very tactical experience. Playing as the Antagonist is stressful and a massive check of skill. This decision should not be about how to maximize your gold income. - Greatly increased the defeat score range for the Antagonist. Antagonists can now get higher scores when losing if they performed well. As the MMR system stood, Raiders and Antagonists were experiencing the same amount of MMR change after each match. There's a few problems with that; It creates MMR inflation and it doesn't properly reflect the skill check that each player has gone through. - Antagonists experience much bigger (x4) MMR changes after each match than Raiders do. This cancels out overall MMR gains to keep inflation on check and also distinguishes playing as the Antagonist as the big skill check it is. - Raiders playing against an Antagonist experience smaller MMR changes than they did before this patch. Of all matchups, this is the one with the most uncertainty. The system can draw less accurate conclusions from it. - Raiders not facing an Antagonist will experience bigger MMR changes than they did before this patch. Of all matchups, this is the most accurate one (AI difficulties are very consistent) and the skill check is quite accurate, if only a bit dissolved across four players. Aequilibrium was balanced around (public, non-guild) Tiers, where the number of players oscilates between 20 and 30. Guilds brought new private and smaller groups, which were being excessively affected by Aequilibrium drift. - Increased Aequilibrium drift starting time from 2 to 4 hours. - Increased Aequilibrium drift speed increments after 6/18/48 hours to 12/36/96 hours. The gameplay team has been very focused on Aneska lately. We're only using this patch to attack a few of the more outstanding issues. - Decreased Ignis Fugit's damage by 10%. - Decrased Nilben Launcher's damage by 10%. - Decreased Shy's infection and bullet damage by 10%. - Decreased O. Tsiklon UV9's damage by 5%. - Decreased Hornet HH3's damage by 5%. - Difficulty no longer affects Wardog Slicer's health points. - Fixed a rare bug where the game was not starting some matches. - Fixed a bug caused by the Beholders' attack that could crash the game. - Fixed a bug where the game could crash when using Rak Mayura's ability right before winning a mission. - Fixed a bug where Harec could become invulnerable when using Firmness card. - Fixed a bug where HIVE's Shy was unintendedly piercing through shields. - Fixed several bugs related to projectile generation. - Fixed a few behavior issues affecting Guardians in A Breath of Hope. - Fixed a bug where extraction missions were not ending properly if there was any Cortez brother on the game. - Fixed several bugs related to Chat. - Fixed a bug where the Squad invite system was not working properly. Aneska's rare weapon's name is "Solaris" in-game and "Invicta" on the store, this latter is the intended name and will be changed in the next update.